A Man of Change is a gift from the Foundation of the First President of the Russian Federation B.N. Yeltsin otherwise known as The Yeltsin Fund, produced in cooperation with Glagoslav Publications and distributed with the aim to preserve the knowledge and memory of Russia's first President.Boris Yeltsin will be remembered as the fierce, daring political leader who fought for democratic ideals of h… is nation during an unprecedented crisis when the Soviet empire had already fallen apart and new emerging nations had not yet firmly established themselves in the region. Russia took over from the previously mighty union of nations, but the country had to be rebuilt and its leadership needed to be reaffirmed.During the years when others were abandoning the sinking ship, Boris Yeltsin showed a remarkable strength of character and took it upon himself to salvage the nation despite unfavorable odds. 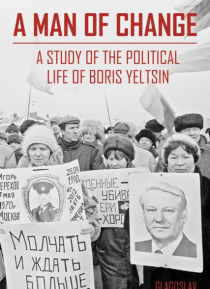 Yeltsin created a stronghold for the new Russian governance, and this book is about a man who worked until it was his time to go, and kept his promise to his native land.